Did anyone else fall in love with Italy after watching “Under the Tuscan Sun”? The restored farmhouse was in the countryside outside Cortona, one of the stops on our Italian Tour! Explore the beauty of this area in this article from visitTuscany.com, https://www.visittuscany.com/en/ideas/cortona-one-day/ , then check out our itinerary here on our blog - we are looking for 15 people to join us on this fabulous trip! I think everyone has one of these tucked away: a handwritten recipe, passed down from one generation to the next. They are usually a little hard to read, a little vague when it comes to directions, and a little magical. If my family was Italian, I suspect this recipe for Limoncello would have come straight from my grandmother’s recipe box. We aren’t, so we had to get a little creative . On a recent trip to Italy my dad cornered a friend of a friend who happened to have his sister’s copy of their old family recipe. It’s as authentic as you can get - from Caserta near Naples - and is DELICIOUS. You have to be patient and plan ahead, this is not something you can whip up an hour before guests arrive for a party. But if you have a few weeks, a big jar, and a dozen lemons hanging around, this could be just the thing you’ll want to be able to pull out of the freezer after dinner with friends. Place the lemon peels in a large jar and cover with the pure alcohol. Cover the jar with plastic wrap and steep for at least a week. Remove the peels from the alcohol. Add sugar and water to a saucepan and heat until sugar is dissolved. Bring to a boil and reduce for 10 minutes. Set aside to cool. Add the cooled simple syrup to the lemon-infused alcohol. Transfer to smaller bottles and pop in the freezer. This beautiful yellow liquor is delicious on a warm afternoon or evening sipped right out of the freezer. It is equally delicious added to champagne! 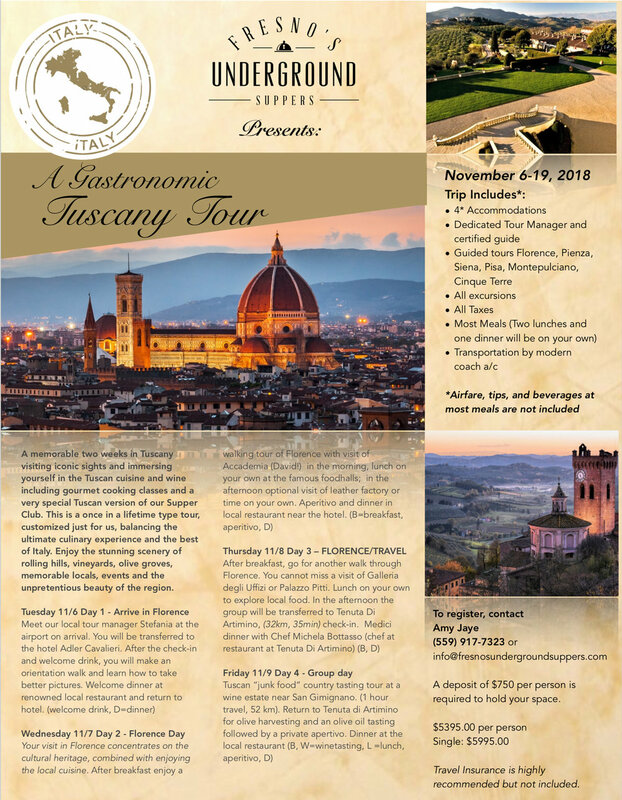 Holy moley you guys, we are so excited to FINALLY share information about our trip to Tuscany this fall! This is a completely customized, food-centric itinerary, filled with once in a lifetime experiences you won’t find on your average tour. Space is very limited - we are keeping this small on purpose - and you, our members, get first chance to reserve your spot. We will be having an apertivo and information night on WEDNESDAY, MARCH 7TH, at 7pm at The Painted Table to answer all your questions. Won’t you please join us? P.S: if you can’t wait for the info night or are unable to attend and want to make your deposit, please email me directly and I’ll make sure to get you the forms! I can’t always answer calls during the day but emails I can usually get to right away. I know right now we are in a bit of a heat wave, but is there anything better than hot chocolate on a crisp night? Especially if it has a little “something extra” added to it? Our bartender extraordinaire Kati Hill shares her recipe for Campfire Cocoa, a cocktail we served at our “Feast in the Forest” dinner earlier this month. Heat milk, cocoa, sugar, and vanilla over a campfire. If you don’t have a campfire a burner on your stove will do. Add the Bulleit Bourbon and Creme de cacao. Pour in mug, top with marshmallows and toast with your blow torch until your preferred shade of brown (or deliciously burnt! ~Amy) Add crushed graham cracker and chocolate syrup to the top before serving.